Bashiok has been rolling with Diablo III questions and answers on the forums after the Blizzcon 2009 wave of revelations. The Diablo III Team is concerned with some spell animations, blood and explosions in 4-player scenarios where the screens simply gets crowded with stuff that gets in the way. In short visibility of monsters and other players gets affected. Bashiok: The spell animations, blood, explosions, and everything else going on can create what Jay mentioned a few times as “soup”. An indistinguishable mess. It’s really only an issue during four player games and even then, to be honest, I personally think it’s all far more readable than it was in Diablo II. But, it’s an ongoing concern and something we’re going to have to continue to work at to make sure you can tell what’s going on. For the second point, development time, there is a lot going on – a lot of areas, creatures, and dungeons created that no one has seen yet and probably won’t see until the game is released. But dev time is certainly always something on people’s minds. We’re constantly refining our tools and processes, and the team just naturally gets better and faster at creating content as they go. I don’t think it’s anything for the community at large to concern themselves with, let the producers sweat it. 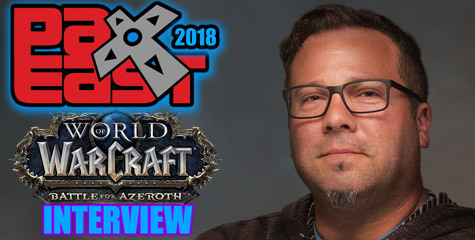 Bashiok: It’s not a recognized part of the Diablo franchise, and to be honest it is so much so not recognized, that when people asked about returning classes in the Q&A’s and in some of the press interviews the Hellfire expansion just wasn’t in anyone’s minds. Plus, it isn’t the same class. We aren’t taking an old class and updating it. The monk from Hellfire, and in fact the story and content of Hellfire, doesn’t exist as far as game lore and story is concerned going into Diablo III. They happen to share a name, the same as all of the other monk classes that have existed in all other RPG’s since the beginning of time. It doesn’t mean they’re related kit/story/flavor wise. A fan asked if the demon fighting the Monk in the trailer was Belial, and surpise-surprise … it is a Morlu Caster. Those into lore and reading novels know that Morlu is a race mentioned in Diablo: The Sin War trilogy. They are reanimated warriors. They don’t look human, but they are armored humanoids wearing ram skull helmets. They served Lucion the Primus, son of Mephisto, and could be found in the depths of the Temple of the Triune fighting each other nonstop, dying and reanimating back to life constantly. It is very cool to see Morlu show up in Diablo III. It means the Diablo: The Sin War Trilogy has much more importance in the Diablo III storyline than previously revealed. Bashiok: The demonic enemy shown in the Monk trailer is a morlu caster, not Belial. Bashiok: There is indeed currently magicfind (MF) on items in Diablo III, as well as a temporary shrine buff. I think though it’s a system we’re just sort of dipping our toes into for the moment. I don’t think it’s accurate to say or even guess that the inclusion of MF means the system will mirror that of Diablo II. We could easily set rules for affix combination, requirement, frequency, and strength to control how and where MF appears in the game. We may decide that MF as a stat is a fun alternative and building sets purely to that end, similar to Diablo II, is what we want to do. Or, we could say that it should just be a fun affix and not something you could stack to meaningful amounts. Putting things like MF, additional XP, additional gold, speed increase, etc. on items now and having them in the demo is really just begging for discussion so please do give some feedback. The Monk’s Seven-sided Strike ability costed half-mana in the demo, so expect various changes to this ability throughout development. Bashiok: I’ll jump in real quick and just say that this ability in the demo cost a little less than half your mana pool, so you’re able to “spam” it exactly twice in a row if starting with full mana. Many fans were concerned about the quality of the Monk Class Trailer shown at Blizzcon 2009. Bashiok clears up everything there is to know about it. Bashiok: Well … yeah, the class announcement trailers are done using nothing but in-game assets. They’re essentially Diablo III machinima if you want to classify it. And they’re effing amazing. Obviously they’re not the pre-rendered cinematics, but if anyone is even confused about that… then that’s pretty cool too actually. Bashiok can you confirm the presence of in-game cutscenes or does that steal from the game as the previous character dialogues as seen in the first gameplay video and that have since been removed? The reason why those close-up character dialogues with the animated portraits were removed was because it took you away from your character and the game. So I’d be really surprised if we had in-game cinematics, but … never say never. Why wasn’t there a female Monk in the demo? Bashiok: There will be a female monk. Women can be monks as well in eastern religions, of which the monk draws the majority of his influence. We’re obviously putting a western spin on it though and making it something specific for Sanctuary. The female monk is still in the concepting stage, so we don’t have any final concepts to show. Loved how Bashiok played around with the Zombie Dogs ability to catch on fire with firebombs or other Witch Doctor abilities to justify possible changes in the way the zombie dogs should benefit from extra damage. It might end up working like a paladin aura that can be switched on and off? Or maybe a buff casted by the Witch Doctor on his pets until they die? What do you think? Bashiok: First thing’s first, the mongrel is now (or again) known as the Zombie Dog. It was the name that was used when the idea was first proposed and all the way through development. Calling it a mongrel was kind of confusing because everyone was so used to calling it a zombie dog for so long, no one remembered to call it a mongrel (dune thresher and fallen imp suffer from it as well to a degree). The name zombie dog doesn’t need to be lore-fied really. It describes the skill perfectly, so why not use it? So anyway, right, the fire and poison/locust enhancements for the zombie dogs was removed. It was a cool idea but it just wasn’t really panning out to be anything meaningful. It was sort of confusing as to why you would be switching between fire and poison, was it to keep an additional DoT active, or maybe there would be tactical reasons for it? But it just wasn’t really jiving in a way that made sense for the rest of the game as it all came together more. It wasn’t shaping up to be a meaningful or fun decision to make on-the-fly. And if you didn’t happen to spec into the skills that would empower the mongrels in different ways, what then? You’re just constantly refreshing a fire DoT on them? To what end? It seemed more and more that a decision that was made at the base skill, either through spending points in another skill (passive potentially), or using particular runes to alter the zombie dogs, made the most sense. I haven’t spoken to the designers about it, so I could be way out of line, but I think the potential for passives that affect all “summoned zombies” is definitely there as there are quite a bit more of them that exist now. The gargantuan, zombie charger, wall of zombies, grasp of the dead, and then the zombie dogs of course. It’s not an issue of coming up with various ways the effects could work, it’s the issue of why is it interesting or fun to switch between the two? Why/when/how would I choose to set my dogs on fire versus poisoning them, and most importantly! could it be done accurately enough so that it actually makes a difference? “Ok I’m a firebomb Witch Doctors. Firebombing, firebombing. Yup, he’s still on fire and doing all that stuff. Always on fire since I use firebomb so much. Repeat the above for locust swarm. “Ok I have firebomb AND locust swarm! Firebombing, cool he’s on f… wait nope I accidentally hit him with locust swa… nope now he’s on fire agai… ok they need to stop getting in my way I want them to be on fire but they… ugh. We attended the Blizzcon 2009 Diablo III Heroes & Monsters Panel at Hall C which described the process of developing various monsters and their unique and special abilities. We divided the videos into four parts. Richard A. Knaak revealed a few details about the upcoming Pocket Books novel titled World of Warcraft: Stormrage (on sale February 23, 2010). Chris Metzen and Micky Neilson said in our interview back on February that this book would deal with the Nightmare in the Emerald Dream and Malfurion Stormrage. Will we get to see some tie-in with the events behind Cataclysm? Omacron from WCRadio and Scrolls of Lore interviewed Christie Golden at Blizzcon 2009. I recorded it on video. Christie reveals the upcoming yet-to-be-titled World of Warcraft trilogy is a tie-in of … Cataclysm. Blizzcon 2009: Will the Diablo II Heroes Return in Diablo III? In Diablo II, we were able to see the fate of the three heroes of the first Diablo game: the Warrior, the Sorceror and the Rogue. All went mad and turned to evil. Will the Diablo II heroes appear in Diablo III? Will we get to see what their fate was in these past 20 years? Pretty much the answer was that we will see at least one of the Diablo II heroes in Diablo III. He didn’t want to comment much on this at this point. As you know the Barbarian in Diablo III is the same one from Diablo II, 20 years older. And now we got confirmation of yet another hero making a cameo in Diablo III. Who do you think this hero will be? The Necromancer, the Assassin, the Amazon, the Druid, the Paladin, or the Sorceress? Will he be a quest giver or have gone mad or succumbed to evil? I guess we just opened a pandora’s box that will make us itch in curiosity for time to come. We are still processing some Diablo III panel videos that DIRECTV didn’t cover. I am currently uploading 5GB worth of HD Video (5 files) to the IncGamers server of which nigh 50% is done. Tamer and Rush will edit them, and once they are ready we will post them on the front page. You will like to hear what Jay Wilson said about Trading in Diablo III. That was one of the few questions I managed to pitch his way. I visited the Pocket Books booth on Saturday at 4pm to record on video the book signing session held by Christie Golden. Jaime Costas and her husband organized a raffle to give away 40 copies of the World of Warcraft: Arthas Collector’s Edition. The place was crowded with fans that were excited to meet her. Below are some photos as a sneak peek until I prepare the videos. Photos explained from left to right … The first photo is Maticus (Worldofwar.net) and J. Allen Brack (WoW Producer Director); second photo is Medievaldragon and J. Allen Brack. The third photo from left to right: Jaime Costas (Pocket Books), Christie Golden, Medievaldragon, Richard A. Knaak and TOKYOPOP Editor-in-Chief Rob Tokar. On this batch, Medievaldragon and Nethaera (WoW Community Manager). On the second one, with Karune (Starcraft II Community Manager). Third one: Greg Street (Ghostcrawler), Medievaldragon, and on the far right: Patrick Magruder (WoW Lead Gameplay Programmer). Need to double check the developer on light-gray shirt. I’m back home. Blizzcon was a blast. I’m a bit bummed I missed some of the panels I wanted to check, but the IncGamers network needed me to record video of some panels that DirecTV were not covering such as the WoW Class Panel, the WoW / Diablo 3 Press Q&A, and Game Systems Panel. On the Starcraft II end, Blizzard shocked fans cold revealing that Glynnis Talken is no longer the voice of Kerrigan the Queen of Blades. The honors go to Battlestar Galactica actress Tricia Helfer who has voiced for Command and Conquer 3: Kane’s Wrath, Spiderman: Web of Shadows, and Halo 3:Orbital Drop Shock Trooper. As a Blizzard fanboy, I haven’t had many grudges over decisions the developer teams have taken over their games in the past seven years. The Sargeras / Eredar oops, the Draenei spacegoats crashing on Azeroth—I forgive all that, and digest it as new lore even if they are retcons. The nerf galore on classes, ok—not world shattering. We move on, and adapt. The Diablo 3 art direction? Who cares the game is AWESOME. But … not hiring Glynnis Talken to voice Kerrigan the Queen of Blades? I’m not happy folks. 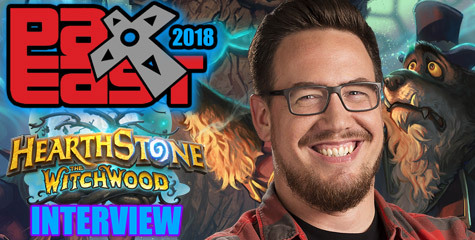 I don’t have a in-depth knowledge of this since I missed the panel, but Maticus from Worldofwar.net told me Ghostcrawler revealed Attack power, defense, MP5, and penetration … all of that will be gone from player’s gear stats in World of Warcraft: Cataclysm. Even Hunter’s Intellect will be gone, replaced by a new feature named Focus. There is probably more changes. I really have no idea what Blizzard has planned to replace all of those stats with. Finally had a break to play World of Warcraft: Cataclysm at the press room for about an hour. And got to write down some stuff that might be of interest to you guys: The racial skills of both the Worgen and the Goblin playable races. Two Forms (Racial) Instant. Turn into your currently inactive form. 1.5 sec cooldown. Viciousness (Racial passive) Increases all damage done by 1%. Aberration (Racial passive) Reduces the duration of all Curses and Diseases used against you by 15%. Flayer (Racial passive) Skinning skill increased by 15 and allows you to skin faster. Darkfight (racial) instant. 3 min cooldown. Activates your true form, increasing movement speed by 70% for 10 sec. Pack Hobgoblin (Racial) Instant. 30 min cooldown. Calls in your personal servant, allowing you bank access for 1 min. Best deals anywhere (Racial): Always receive the best possible gold discount, regardless of faction. Better living through chemistry (Racial) Alchemy skill increased by 15. Rocket Barrage (Racial) 30 yrd range. Instant. 2 min cooldown. Launches your belt rockets at an enemy dealing 38 fire damage. Rocket Jump (Racial) Instant. 2 min cooldown. Activates your rocket belt to jump forward. Time is money (Racial) Cash in on a 1% increase to attack and casting speed. What do you guys think about each race and their racial skills? Our release target for StarCraft II: Wings of Liberty is the first half of 2010. As with all Blizzard Entertainment games, we will take as much time as needed to ensure the game is as fun, balanced, and polished as possible. When will you begin the beta test for StarCraft II? An ancient evil lies dormant within Deepholm, the domain of earth in the Elemental Plane. Hidden away in a secluded sanctuary, the corrupted Dragon Aspect Deathwing has waited, recovering from the wounds of his last battle against Azeroth and biding his time until he can reforge the world in molten fire. Blizzard Entertainment’s third expansion to World of Warcraft forever alters the face of Azeroth, as the destruction left in Deathwing’s wake reshapes the land and reveals secrets long sealed away. Players will be able to re-experience familiar zones across Kalimdor and the Eastern Kingdoms, areas rewrought by the cataclysm and filled with new opportunities for adventure. In an effort to survive the world-shattering cataclysm, two new playable races—worgen and goblins—will join the struggle between Alliance and Horde. As players journey to the new level cap of 85, they’ll explore newly revealed zones, acquire new levels of power, and come face to face with Deathwing in a battle to determine the fate of the world. Two New Playable Races: Adventure as one of two new races—the cursed worgen with the Alliance or the resourceful goblins with the Horde. New High-Level Zones: Explore newly opened parts of the world, including Uldum, Grim Batol, and the great Sunken City of Vashj’ir beneath the sea. World of Warcraft: Cataclyms has shocked fans all across the globe. No one saw coming how Blizzard would deal with a complete overhaul of Azeroth as we know it. Some areas are volcanic lava lands, while other known deserts such as The Barrens and Desolace are now partial forests. Some places are split in half, others sundered underwater. We got here some screenshots for you straight from our Press Kit CD courtesy of Blizzard Entertainment. You can watch here the World of Warcraft: Cataclysm video shown at Blizzcon 2009. This is cataclysm and shocking to say the least. The world of Azeroth has changed in ways we did never imagine Blizzard would ever dare going. You can really say you didn’t see this coming. IT’S OFFICIAL FOLKS!!! World of Warcraft: Cataclysm was unveiled by no other than our beloved Chris Metzen (VP of Creative Design). Deathwing is back, and the face of Azeroth has changed. Old villages are now destroyed, lava runs amok everywhere in Kalimdor and Eastern Kingdoms. The Goblins (Horde)and Worgen (Alliance) are officially new playable races. Gilneas Greymane Wall collapsed during the cataclysm. The residents are now cursed with the worgen state. We can now fly in Azeroth. I will now start uploading our press kits full of screenshots and details. Check back shortly. Grim Batol is in development based on the story from WoW: Night of the Dragon. Mount Hyjal present is a new dungeon or zone. Hyjal is under siege by Ragnaros sending his elemental army to burn the World Tree. Malfurion Stormrage is back from the Emerald Dream. The Barrens Split is broken in half by the middle. Naralex is trying to regrow life into the Barrens in early quests in Wailing Caverns, well he was successful, you can see Barrens with life, and forests. While other areas are lava-like. Uldum is a new dungeon. There will be a cat-like race inside. Twilight Highlands is the Twilight’s Hammer base of operations. The Twilight Dragonflight has risen. Tol Barad is introduced as a prison isle. Three new PvP battlegrounds. One is Tol Barad and another in Gilneas. New Arena Maps. Desolace looks full of vegetation in some areas. The druids seem to be doing their work around some areas after our experience in low level quests. All IncGamers fansites are logged into the live blog from Blizzcon’s Press Room. Join the chatting, and as new stuff happens Flux (diii.net), Maticus (Worldofwar.net), Elly, Rush, Leord (StarcraftWire.net) and me will be on top of things. Thursday was a fun day for all fansites who attended the Fansites Summit at the Blizzard Entertainment campus. All fansites waited together at the Marriott Hotel’s lobby awaiting the arrival of the bus. Bashiok took the lead and gave everyone their NDA sheets, and some free Breakfast tickets for the local Cafe del Sol restaurant. From there we traveled to the campus where the awesome Wolf Rider statue welcomed us. We immediately moved to the Theather room where no recordings or photos were allowed as said by our NDA—so if you get to see any photos of that, someone is in trouble. Bashiok started by loading Diablo III onscreen and playing a male Wizard in what looked like Act II in a desert. By the NPC dialogue, it was near Caldeum. Caldum Guard: It’s not safe here. We need to move. Asheara: Alcarnus is lost. There’s no hope. Caldeum Guard: No sign of them, Captain. Asheara: The desert is overrun. Didn’t get to catch much of the dialogues, but that pretty much let’s you know the situation. Objective: Follow the road to Alcarnus. We got to see many monsters in the area such as the Sand Wasp in various sizes. There is voice over every few seconds throughout your journey, making it a pleasant and more vivid experience as you travel through the canyon. You find optional quests too. One of them asks you to find the outlaw camp. However, some of this characters you find may be a trap. Bashiok got to talk to a weeping girl and suddenly the screen fill up with monsters from all directions. The inventory was redesigned from what we have seen before. Now it holds items that take only one slot, but some items take up to two slots like in Diablo II to show off nice art where it’s worth. Bashiok reached a place named the Howling Plateau. Here we saw a monster named Lacuni Warriors, Lacuni Huntress, Fallen Overseer, and other varieties, and more Sand Wasps. At some point, Bashiok loaded a female Witch Doctor. We saw a unique that almost kills Bashiok’s: Blade Jade. We saw the three Skill trees: Zombie, Spirit and Voodoo. One of the few we got to see said Spirit Vessel: Gain 20 mana whenever you pick up a health globe (rank 2/5). Next level gain 30 mana. Some items will be unidentified, but if you have scrolls of identify, you only need to click the item (I’m guessing with the left-button but may be wrong) and it auto-identify. We saw the ability that fears mobs. A huge witch doctor ghostly figure appear above the female witch doctor and moves his hands around with a threatening pose animation. Looks pretty nice. Mobs run in fear in all directions. Another ability causes a corpse to come out of the ground to spew corpse spiders to attack your enemies. We got to see Fallen Hound in the area named Canyon RIm Mines. Here we got to see for the first time a waypoint. It looks like a stony floor with a swirl. When you step in you are teleported to some areas. In this case a ruins. Bashiok showed us the skill trees again and explained that their new system allows to diversify your class in comparison with other players. The philosophy is that you can place skill points in any of the three trees simultaneously and for as long as there is 2 points in Zombie tree, one point in Spirit tree and two points in Vodoo tree (for example) completing a total of 5 points in Tier 1, you automatically unlock Tier 2, and you can continue spreading your points. Once you reach the limit across all trees, you unlock Tier 3, and so on. That’s pretty cool because it doesn’t hamstring your capability to spend and mismatch points where you wish, nor need to spent a bunch of points in a single ability to unlock the next tier. You can now drag any of the spell icons from any of the skill trees into the spellbar UI. Respecs will be available in Diablo III as mentioned a few weeks ago. We got to see a special monster named Champion Lacuni Huntress with a blue tag. Below its name it said (Frozen). We saw the return of shrines. He found a desecrated shrine, and somehow restored it granting him a special buff. Bashiok says if you get one of these buffs you should use them immediately upon any monsters around you. It lasts a minute or less. Some of these buffs may be skill amount bonus, damage bonus, and such. We saw a new monster that can be a pain in the neck for how annoying it is. Bashiok assures it is easy to learn the mechanics after a while. The Dune Dervish is a very tall and thin monster. Once you aggro, he starts spinning and that’s bad for you. While this happens, many other monsters attack you, including a Fallen Shaman who ranges you while you are dodging all the monsters and trying to get the heck out of the Dune Dervish’s way. The annoying part of this monster is that if you don’t kill him within the first three seconds, any spells you throw at him are reflected back at you, and that’s a no-good thing to happen with all the damage you are getting. Basically, you get owned. May be a good idea to have healing pots just in case. They are nasty. We got to see some new witch doctor spells from the skill trees such as Fetish Army which allows you to summon 15 freaking Fetish guys—you know those little annoying tribemen from the jungle act in Diablo II. Parasite converts any mob into a zombie to fight for you. Gargantuan is a buffed up zombie dog, Grasp of Dead, Sacrifice, Mass Confusion, Spirit Barrage, and Horrify among others. After the Diablo III demonstration, we separated into groups for Franchise specific tours. We walked throughout the World of Warcraft team offices. Then we had lunch at the cafeteria with developers from each game who were open to questions. From the Diablo III team Nate Bowden (Environment Artist), Dave Adams (Lead Level Designer), and Chris Haga (FX Artist). Here we got a lot of photos from today’s Blizzcon 2009 Fansite Summit. I got photos with Nethaera, Karune, Ghostcrawler, and Patrick Magruder (WoW Lead Gameplay Programmer). 5:41pm PDT: Seems I misunderstood Eldorian. Told him I would rather spend the next couple of hours updating you guys. I will start uploading stuff shortly, and writing up a summary of what went down over at the Blizzard campus. 5:30pm PDT: It’s been a fun day with all the fansites invited by Blizzard Entertainment. All those with press badges had the chance to visit the campus in Irvine. We witnessed a powerpoint presentation led by Bashiok and Karune. Bashiok played Diablo 3 in a huge theather screen showing off the male wizard and the female witch doctor. I will have some short updates about it once I come from some commitments. Eldorian is waiting me right now at his room to hang out. There is a party organized by WoW.com where everyone seems to be heading to at the Annabelle Hotel. I do have photos from the outdoors of Blizzard, and the cafeteria. We couldn’t take photos or record anything at the presentation sadly. However, it was very cool to see some Diablo 3 gameplay and some of the plans Blizzard has in store for fansites. So from what little bits we could get from the Blizzard folks something big about Battle.net will be announced between 3:30-4:30pm on Friday. The lack of WoW content in the presentation, and some master dodging of questions by Nethaera points by guess to a new expansion. Gosh, is it hard to get anything from Nethaera … lol. Such a tease. Some bit that is unconfirmed by funnily answered when I asked if there would be a new Diablo 3 class reveal—there was a lot of dodging that question, but in murmur I heard a—- maaaaybe. So let’s see what tomorrow brings from Mike Morhaime at the presentation, and subsequent panels. For now, Eldorian updated our Twitter with some stuff. I think he uploaded some photos of his Goody Bag. Or so I thought. I will upload those when I get back. I will try to upload some of the images later tonight. Need to jet. The actual schedule is yet to be posted up. Please do not panic. Your sunglasses are designed to protect you from seeing that which may cause said panic. Make sure to pack your towel and your babel fish. Another water-based joke? Hmm. I won’t say anything since people lately say I look too much into things, or “stretch”. Thanks, Handclaw. 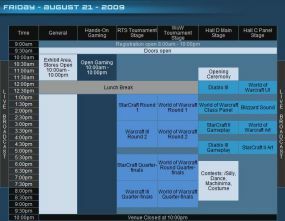 IRVINE, Calif., Aug 18, 2009 (BUSINESS WIRE)—Blizzard Entertainment’s two-day gaming festival, BlizzCon(R) 2009, begins on Friday, August 21, at the Anaheim Convention Center in Anaheim, California. 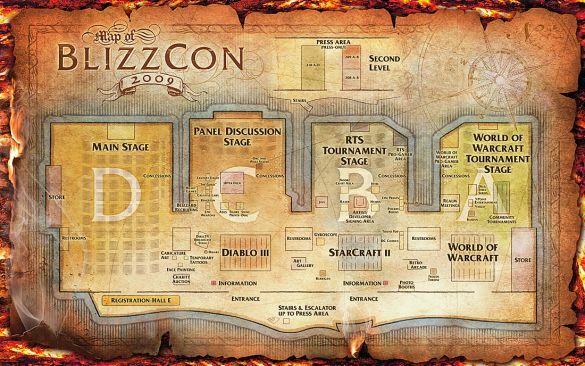 The convention celebrates Blizzard Entertainment’s Warcraft(R), StarCraft(R), and Diablo(R) game universes and the communities of players surrounding them. Attendees of the sold-out show will be able to play the latest versions of Blizzard Entertainment(R) games as well as speak with developers in discussion panels, participate in tournaments and contests, and meet with fellow gamers and friends. The show will close on Saturday evening with an epic concert featuring the Prince of Darkness himself, Ozzy Osbourne. In addition, Blizzard Entertainment’s own Warcraft-themed metal band Level 80 Elite Tauren Chieftain will be performing, and Jay Mohr has returned to act as the master of ceremonies for the community contests taking place on Friday. 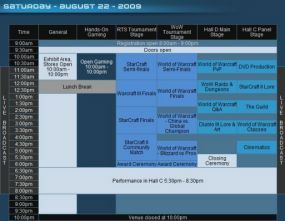 Those unable to attend are still able to purchase a “virtual ticket” to the show, featuring more than 18 hours of live coverage as well as the exclusive BlizzCon 2009 World of Warcraft in-game pet. This package is available both via Internet stream in over 100 countries and in HD through DIRECTV(R) satellite television service. Visit the official BlizzCon website, http://www.blizzcon.com, for more information on the virtual ticket, or to read daily coverage of the show’s highlights. BlizzCon would not be possible without the enthusiasm of Blizzard Entertainment gamers around the world and the generous support of the event’s sponsors, who provide demo station hardware and peripherals, contest prizes, and more. This year’s platinum-level sponsors are ASUS, DIRECTV, Intel, Mountain Dew, NVIDIA, and Razer; the gold-level sponsors are Cisco, Dell, Kingston, SteelSeries, and Vasco. 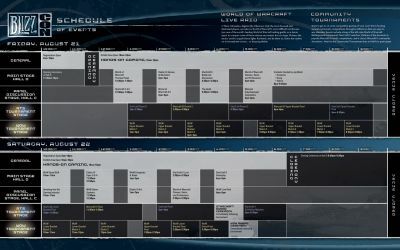 Blizzard Entertainment has released the Blizzcon 2009 schedule for Friday and Saturday plus a WoW-style Floor Map of the Anaheim Convention Center where you can spot which Stages are for Diablo 3, Starcraft II and World of Warcraft. 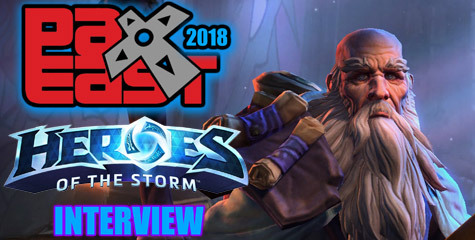 On this page you’ll find the locations and times for the major events that will take place during the convention, such as hands-on gaming, tournaments, contests, and of course the developer panels where Blizzard’s game designers talk about the many aspects of making a great game.